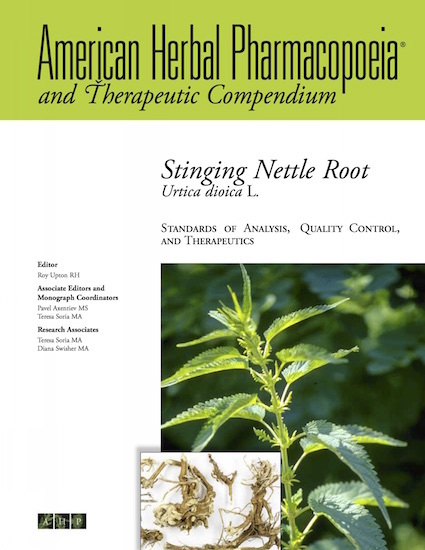 Stinging nettle root (Urtica dioica) historically has been used for urinary complaints, and the AHP Therapeutic Compendium provides a critical review of both the traditional and scientific data. Dr Sigrun Chrubasik, the primary author of the therapeutics section, which addresses pharmacology and clinical research, is an expert in clinical botanical medicine research and has published numerous scientific articles on a variety of botanical ingredients, with a focus on pain management and inflammation. According to Dr Chrubasik’s review, while there is less than definitive data regarding the full clinical utility of nettle roots, the data trends toward efficacy in its beneficial effects in treating prostate enlargement. As noted in the standards portion of the monograph, the compounds correlated with activity are similarly elusive, although there are indications for potential activity of a number of compounds, including sterols, polysaccharides, and Urtica dioica agglutinin (UDA). The analytical testing requirements of the AHP monograph differ from those of other monographs (e.g., USP), which require analysis of total amino acids as a surrogate marker for the putatively active nettle root protein UDA in addition to the compounds scopoletin and β-sitosterol. However, the proposed USP methodology may provide false positive results from degraded UDA or from other unrelated proteins having a similar amino acid profile. An immunochemical approach, such as ELISA, would be more appropriate; however, the necessary materials are currently unavailable. Similarly, while USP allows for mixtures of Urtica dioica and Urtica urens roots to be acceptable, AHP considers the roots of the two species to be too different to be used interchangeably. It is clear that the above ground parts of Urtica species are very similar morphologically, chemically, and therapeutically. However, the roots are completely different in this regard and we do not believe they should be used interchangeably. In addition, there is little historical use for Urtica urens root for urinary tract complaints and no scientific data supporting this use.